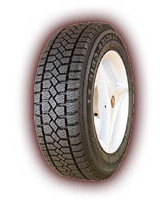 Unique to this studless snow tire design, the compound contains a special particle additive which helps to increase traction by forming additional gripping edges. This is especially beneficial for ice traction. Sizes 205/55R16, 225/60R16, and 215/65R16 are available in the Wintermaster XRT design.